Cuarón’s follow-up to Gravity upends this critique. Roma, his thoroughly astonishing, black-and-white, autobiographical character study that serves as the Centerpiece of this year’s New York Film Festival, is undeniably virtuosic—thrillingly so. But it rarely calls attention to itself or, more precisely, to its own constructedness. Instead, from its first frames, it establishes a studied formal approach that breaks decisively from its predecessors and establishes a more subdued “art film” aesthetic. Auteurists would have a hard time defining the Cuarónian visual language after comparing, say, the Emmanuel Lubezki-filmed handheld, long-take, blood-spattered shots that follow Clive Owen through a prison camp in Children of Men to Roma’s opening shot. At Roma’s outset, a stationary camera fixes on a floor, its diamond-shaped tiles filling the frame as the sound of water is audible. Occasionally, a sudsy stream flows over the tiles. A plane flying overhead reflects into the camera from the water. 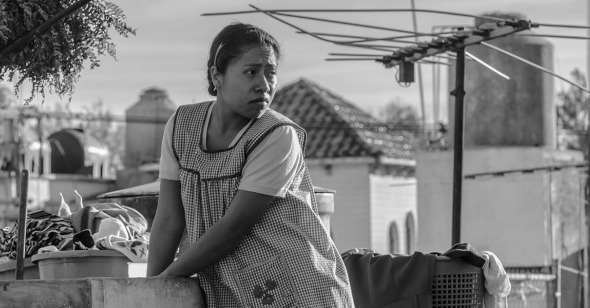 After a considerable period of stillness, the camera tilts up, to reveal Cleo (Yalitza Aparicio), the film’s protagonist and the maid to a middle-class family in Mexico City, as she finishes cleaning this gated driveway. It pans to the left, then to the right, methodically, to track her movements. This is a movie made of pans and tilts, attuned as much to spaces as people, less kinetic and less frantic than what we’ve grown accustomed to from this filmmaker. Yet Roma is of a piece with Cuarón’s body of work, if we frame his filmography less in terms of a consistent visual signature than an enduring engagement with subjectivity, point of view, and the capacity of sound and the moving image to instantiate a form of cinematic embodiment. In this, Roma does not simply improve upon its predecessors, but improves them. This is the sort of fully mature work from a master craftsman that reveals what his less fully successful films have been pointing toward all along. The accomplishment of Roma is experiential. Its attention to sound, setting, and how bodies and things occupy space have the effect of radically aligning the viewer to a particular perspective that is fully located within the narrative world of the film. An early sequence involving the quotidian act of watching television illustrates this perfectly. Cleo moves around the living room as the parents and children watch together. We see her looking at the television, smiling while she slowly collects dirty dishes from the family members scattered around the couch and chairs. The camera moves with her, and then remains fixed when she settles next to one of the children, who puts his arm around her as she kneels next to the couch, laughing with the family at the program they enjoy together. It is clear from this moment that she occupies an important position in the household unit, that they share a genuine emotional bond. Then the matriarch, Señora Sofia (Marina de Tavira) asks her to make tea for her husband (Fernando Grediaga), and it becomes just as clear that she is an employee, not a family member. This is hardly a profound observation, but it has an extraordinary effect: because of the way Cuarón’s camera frames Aparicio, we are usually aware that she is in but not of the spaces she occupies; because of the way he relies upon her to motivate the movement of his camera, as viewers we are placed constantly into her position of liminality. Based in part on memories from his own childhood, Roma tracks Cleo and the family she works for over the course of a year together from 1970-71. This brief span of time includes life-altering events for all of the movie’s principal characters. Roma, however, is more interested in the rhythm of life and the emotional texture of the everyday than with incident. Thus, Cuarón devotes significant portions of his film, particularly in its first half, to the mundanities of cleaning dog feces, handwashing laundry, and a particularly difficult bit of urban car parking. This patience yields dividends. By the time Cuarón’s movie heightens the emotional stakes—and it most certainly does—it has accrued an emotional resonance that makes its most harrowing sequences feel fully earned. While Roma may play, in theory, as a portrait of the filmmaker as a young man, Cuarón here focuses not on himself but on two women from wildly different circumstances, each dealing with a profound loss and an emotional betrayal. Cuarón gives his viewers more visibility to these parallel traumas than the characters have. Because of class, milieu, and inequity, neither of these women ever sees the other in the way we do. This makes Roma a gentle and especially convincing political film. It would have been easier to make a political point by dramatizing gross abuses of power or extreme wealth or poverty. By contrast, Roma’s political provocations are far subtler. Cleo rises every morning before the family she serves and wakes the children one by one, not with resentment but with genuine affection. She carries her employer’s suitcases to his car, and he offers to help her after she’s already loaded them into the trunk. Nevertheless, the offer of help is sincere. And Señora Sofia and Cleo are oddly kindred souls, women who could commiserate over their shared pain, except that the power dynamic between them makes this empathy plainly impossible. This succeeds in no small part because of the centered, humane performances by Tavira and Aparicio, who both achieve, with almost disarming affectlessness, a quality that might best be described as presence. Roma contains within it some bravura set pieces that expand far beyond the lives of Cleo and Sofia, evoking outside dangers that threaten to invade their smaller human struggles. At these moments Cuarón, acting as his own director of photography, manages to stage highly complex sequences featuring either multitudes of actors or challenging natural elements without breaking his studied formal approach. To Cuarón’s credit, these “big scenes” never distract from the intimate dramas at the film’s center. Rather, we’re always looking for Cleo and Sofia past the fires and the riots that might overtake its narrative space. A first time actor, Aparicio in particular brings a directness and emotional accessibility that disarm, confound, and exhilarate. Whether she’s doing the laundry, cleaning the dishes, or making the beds, we can’t stop looking at her. And thanks to Aparicio and Cuarón, we actually, honestly see her. Even more than a child born to an infertile world or an astronaut saved from outer space peril, that feels like a genuine miracle.